Wine Tasting Archives - TheUrbanMusicScene.com | Concerts & Festivals! 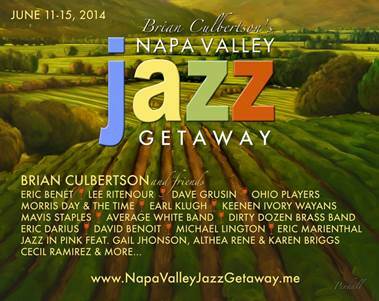 Brian Culbertson assembles an array of jazz & funk stars for the 2014 Napa Valley Jazz Getaway. Los Angeles, Calif. (7 October 2013): While in the midst of the vineyards last June to shoot a promotional clip for the third annual Napa Valley Jazz Getaway, the flourishing jazz and wine festival’s Founder and Artistic Director Brian Culbertson looked into the camera and vowed “More artists, more music, more food and of course, more wine.” The hit-making contemporary jazz and R&B mixologist is making good on his promise with the unveiling of the powerhouse lineup of jazz and funk artists that will perform for the many thousands of Getaway attendees who will come from all over the U.S. to Napa Valley from June 11-15, 2014. Gum Spring, VA, August 30, 2013 –(PR.com)– The wines of golf legend Retief Goosen will be showcased at the 8th annual South African Food & Wine Festival, September 14th & 15th 2013 at Grayhaven Winery, Gum Spring, Virginia. The festival invites wine lovers, foodies and families to learn about South Africa through this two day celebration of South African culture, food, wine and music. indoor and outdoor venues around Healdsburg. 2011 festival includes 2 sessions to meet popular demand. from around the globe to sample plus an array of light hors d’oeuvres. sessions; one in the afternoon, from 3-6pm and one in the evening, from 8-11pm. explains Sam Kimball of Marquee Concerts, producers of the festival. out each 3 hour tasting,” he adds. To continue, Please click “MORE”!